Info "Use the clippers to shave it all off!" Shear Terror is one of Kat and Ana's microgames in WarioWare: Smooth Moves. The name is pun on "sheer terror". The player must shave off all of the animal's fur and, very rarely, an alien fur. 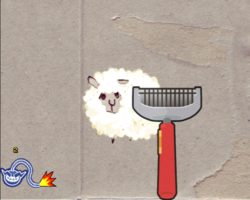 1st level difficulty: The player must shave off a sheep. 2nd level difficulty: The player must shave off a dog, which has slightly more fur. 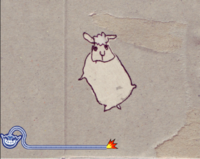 3rd level difficulty: The player must shave off a woolly elephant or a llama in the European version. This page was last edited on January 23, 2019, at 19:36.